Restaurants are a popular idea for starting a new business. People enjoy sharing their love of cooking with their friends and neighbors, so the plan comes together pretty naturally. And with the right strategy, a restaurant can be very successful. Those that fail have often made some very obvious errors, usually involving their spending. The main area where most restaurants spend their money starting out is equipment. Their management understands that there’s no way to develop a menu or train cooks without good ovens, grills, Walk In Freezers, and countless other equipment. Yet many of them do not understand that there are right ways and wrong ways to go about getting that equipment into the restaurant and put to work. Similar to having a good restaurant management strategy, you need to buy restaurant equipment strategically. These basic ideas should help deepen your own understanding of the best ways to equip your bistro, cafe, or diner. Don’t Be Afraid To Borrow! It’s human nature to prefer paying cash instead of borrowing money, especially for people with good business instincts. But it’s not always the best option. In practice, the complexities of the tax code, business financing, and bookkeeping could mean it’s best for you to finance something that you could technically pay cash for. Startups have a lot of options for financing. There are a variety of ways that they can get special loans and other funding that will permit them to keep their cash for purposes that can’t be handled with financing. Before letting your reserves go out the door for equipment, investigate these options with the help of a qualified accountant. Another aversion many budding business owners have is buying new. They feel like a used car can save money, so why couldn’t used restaurant equipment and fixtures save money? The difference is in wear and tear. Bear in mind that any used equipment you buy has been released by its previous owner for one of two reasons: They upgraded, or they went out of business. You do not need to have attended top executive MBA programs to figure that out. If it’s from an upgrade, the business was busy and the equipment may be worn out. If it’s a liquidation, the previous owners may have been lax about maintenance and care. You don’t want either one. Your capital purchases are the lifeblood of your menu. You have to be able to store, prepare, and cook food properly, and junk equipment will not meet your standards. It will inhibit your ability to save on energy, store food safely, and present your restaurant in an appealing way. Restaurant supplies are going to be different than kitchen supplies. You have to realize this before you go buying restaurant equipment. Restaurant dishes are not cheap, but this is for a good reason. Restaurant dishes and flatware are going to take a lot more wear and tear than your typical home kitchen supplies. Restaurant supplies need to be able to withstand restaurant kitchen dishwashers, which are very powerful. Make sure you keep this in mind when shopping for business loan alternatives. Even if you are trying to save money on restaurant startup costs, the dishes are not something you should cheap out on. Once you’ve bought a major piece of equipment, it can be easy to put that task out of your mind and consider it something you won’t deal with again for many years. But another part of the investment side is planning on replacement. Make sure you understand the expected life of each item that you buy, and have a plan for financing it as soon as it’s needed. Stringing an appliance along for five extra years can sound good, but it’s much more likely to experience a complete failure that could leave you in a real pinch at the dinner rush. This is a philosophy that should match with your entire operation. Just as you shouldn’t assume that today’s recipes will be good enough in ten years, you also shouldn’t assume your equipment will hold up that long. 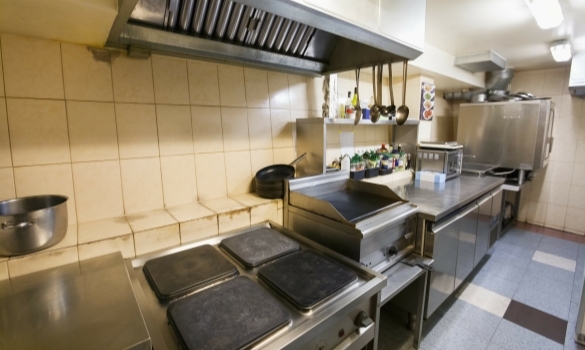 Always have a proper business insurance policy in place and budget ahead for replacing restaurant equipment. Buying used restaurant equipment does come with it’s own share of risks. However, startup restaurant owners should know that the top of the line brands last a long time. If the equipment safety and maintenance is like new, you can save some cash on quality equipment. The top restaurant equipment bands have higher quality manufacturing standards. Even if the equipment has a few blemishes, they are in perfect working condition. This could save you plenty of money upfront and pay off as a strong investment down the line. Owning a restaurant has its share of hazards, but for those who manage it properly, it can be a rewarding, satisfying, and lucrative venture. Making good decisions about equipment is a big ingredient in your restaurant’s financial health. Do not follow along with fast-fading small business trends. Invest in the best restaurant equipment to help you realize success.